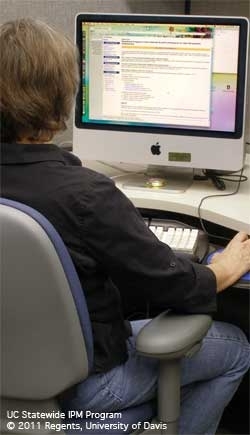 UC IPM online courses offer continuing education units. Nov. 19 deadline coming. Statewide IPM Program staff members work closely with area IPM advisors, farm advisors, specialists, and researchers to develop educational programs that reflect the newest advances in pest management. These online courses are FREE. Additional training materials, including videos, DVDs, books, and leaflets, are available in the Publications section. Check the Workshops & Events page for in-person presentations and hands-on training opportunities. Many of these training materials can gain Continuing Education Credits through, such organization as the Department of Pesticide Regulation, the Structural Pest Control Board or provide a Certificate of Completion from the University of California. More training courses are planned in the future. The videos don't allow for CEUs, but they can be useful as part of training and learning activities.